I have always enjoyed playing and watching football, so joined HotScots FC in 2008 as I was keen to make some more friends and improve my fitness. At the time, I wasn’t out to my family and didn’t have many LGBT friends so I felt that the HotScots could be a great opportunity for me to meet with like-minded people with similar interests. When I emailed HotScots, they were very welcoming and offered me the option to either join them at their next training session or at a social event they had organised. After deciding to join the social, I joined the club – and I can’t believe I am now in my eighth year as a member! Since joining, I now have a close group of friends and I am much happier within myself. Also, I have come out to friends and family, with their reactions being even better than I thought they would. With the HotScots participating in a UK-wide gay-friendly league I have had the opportunity to travel across the country with the team, and I have made friends with a number of people from other clubs. I was also able to play for the HotScots in international tournaments in Stockholm and in Antwerp – where I scored my first goal for the club! The competitions have been inclusive and varied between 5s and 11s, with opportunities to socialise with others as well as play football. Not only has HotScots had a significant impact on my personal life, but playing football has helped me keep fit, and helped me become more comfortable within myself. I have made new friends and visited places that I wouldn’t have otherwise. The whole network has been very supportive, and eight years on I am still glad I made the decision to join the club! 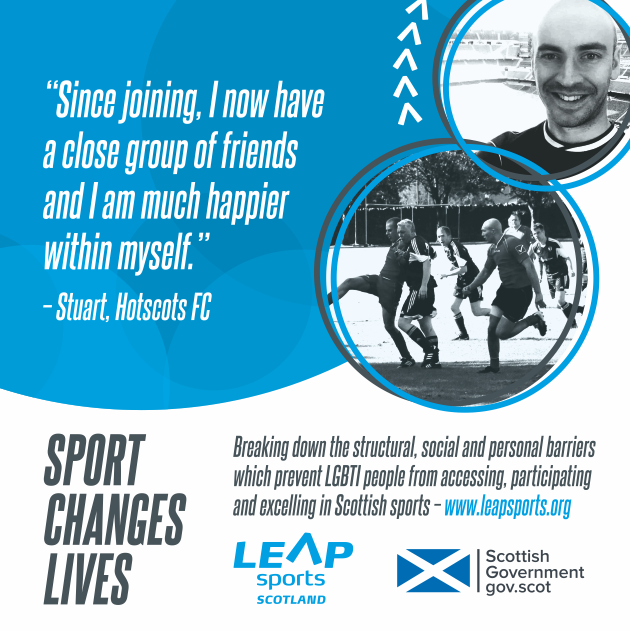 HotScots is a community club who welcome anyone with an interest in football and is honoured to be Scotland’s first LGBT football team. HotScots play weekly in the GFSN league as well as other tournaments around the world, and we pride ourselves on offering opportunities for all whilst remaining competitive on the pitch. Written on 2nd January 2017.